Ron Douglas fires up his outrageously successful America's Most Wanted Recipes series in this essential guide to recreating the most popular grilled dishes from the country's most famous restaurants. 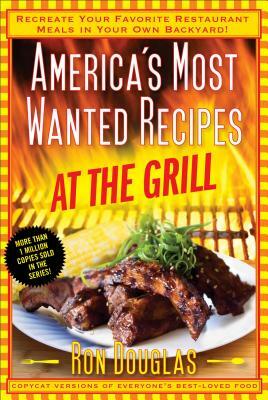 Inside America's Most Wanted Recipes At the Grill, you'll find more than 150 copycat recipes from the most popular restaurants in the US, including Applebee's Riblets with Honey Barbecue Sauce, California Pizza Kitchen's Jamaican Jerk Chicken Pizza, the Cheesecake Factory's SkinnyLicious Grilled Chicken, Famous Dave's Pit Barbeque Ribs, KFC's Honey BBQ Sauce, TGI Friday's Jack Daniels Grill Glaze, and much, much more. Every dish has been tested and tweaked to taste just like the original. You'll impress your friends and family with these copycat versions--or by putting a healthy twist on them and preparing the dishes exactly to your liking. Also included in the book is a special grilling guide to help home chefs become the grill master their guests will be raving about all year long. So fire up the grill and get ready to taste your favorite restaurant dishes at home.